INTRODUCTION: Today, the Zika virus has public health officials alarmed in Texas and across the nation—for good reason. It’s a devastating disease for pregnant women and their babies; controlling its spread will depend in large part on how robust our public health infrastructure turns out to be. Read below how I chronicled many of the shortcomings of the medical and public health response in 2012, when West Nile virus was making headlines in the Lone Star State. The disease, which killed dozens and left hundreds with neurological damage, is also spread by mosquitoes. Editor’s Note: A version of this story is published at http://bit.ly/1tRikNC. 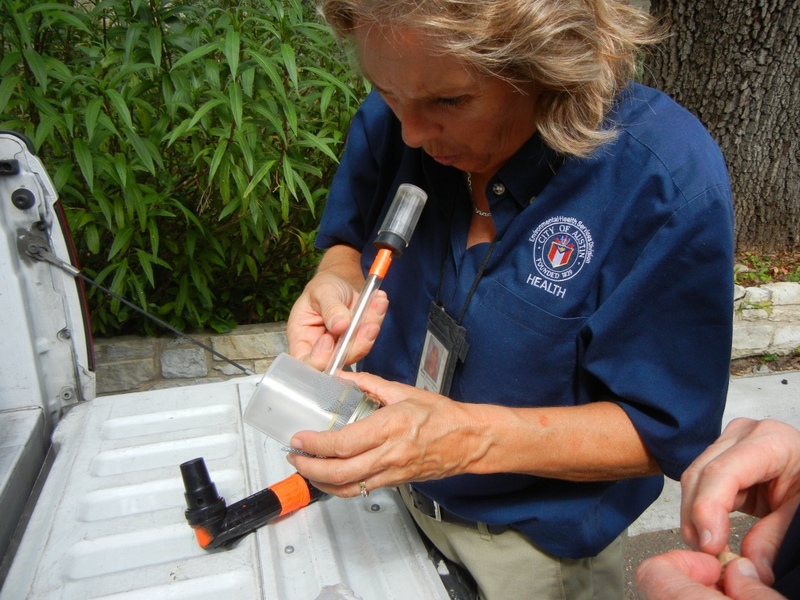 Mary Edmonson with the City of Austin’s Environmental Health Services removes mosquitoes from traps for testing in July 2013. Sean Lemoine’s old life ended one day in August 2009, when he found himself feeling unusually tired. The then 36-year-old Dallas attorney’s head ached and he had trouble focusing his eyes. He thought he might have the H1N1 flu that was going around but a blood test soon disproved that theory. His headache worsened and other symptoms began to emerge. Later, after being diagnosed with West Nile, he would remember working in his mosquito-infested yard a week or so before becoming ill. But at that point, no one had any idea what was wrong. When his wife, Elizabeth, drove him to the emergency room two days after he first got sick, Lemoine was vomiting, blacking out, and losing his balance. He was admitted to the hospital that night and grew sicker and more disoriented throughout the next day. During that time, as Elizabeth recalls, doctors determined that Lemoine suffered from meningitis, though they did not know the cause. He also had pneumonia. When his lung collapsed and his blood pressure plummeted, they placed him in the intensive care unit under sedation so a breathing tube could be put down his throat. Days later, doctors had to insert a tube directly into his windpipe. There were moments when Elizabeth feared her husband was brain dead, she said, and moments when she was sure he was “still in there.” Lemoine eventually came back to consciousness, as doctors, after performing the tracheostomy, were able to lighten his sedation. Lemoine remembers waking up hooked to a breathing machine. He had a 105-degree temperature and was not able move from the neck down, he said. Once stable enough to travel, Lemoine was taken to a long-term acute care hospital in Dallas where he spent nearly two months. Next, he spent about four months in a rehabilitation facility, where he dealt with recurring infections and was slowly weaned off the breathing machine. Though he has made a remarkable come back, his life since contracting West Nile neuroinvasive disease will never be the same. Months of extensive therapy have helped him talk better and use his limbs. But today, four years later, he can still only walk short distances without a cane. His immune system is weak and his right lung does not function. But Lemoine is grateful he survived. He returned to practicing law in 2011, and has been able to try cases, with certain accommodations. “If I was a plumber or carpenter or somebody who had to stand … I would have been in real trouble,” he said. Experts believe that most people who become ill from West Nile virus suffer only from the short-lived West Nile fever. Less than one percent are thought to experience the neuroinvasive form of the disease, like Lemoine did, which can be much more severe and tends to have lasting effects on the central nervous system or brain. It’s not known why some people get much sicker than others. Regardless of statistics, those who have seen what the disease can do take it very seriously. “Even though it’s rare, if you get it, it’s 100 percent for you and it can be devastating,” said Dr. Robert Haley, a West Nile expert with UT Southwestern Medical Center in Dallas. In 2012, numbers of both types of cases were high nationwide, but soared in Texas. Official sources reported 844 cases of neuroinvasive West Nile and 1,024 cases of fever that year in the state. Within Texas, the Dallas area was hit so hard that local officials declared a state of emergency, and engaged in the first aerial spraying to kill mosquitoes in more than 40 years. It was the largest and most deadly outbreak Texas had experienced since the disease first appeared in 2002, and cost the state an estimated $50 million in acute medical care and productivity losses, according to one study published by the Centers for Disease Control and Prevention. Since arriving in Texas, numbers of reported cases of the virus have fluctuated but have never approached the 2012 figures. That year, 89 Texans died, which was about one third of all fatalities attributed to West Nile in 2012 nationally. And Texas cases were more than two and a half times the state’s previous high of 720 cases in 2003. The virus is carried by mosquitoes and the infected animals, especially birds, on which they feed. It came from Europe or the Middle East to New York City in 1999, experts believe, and spread rapidly across the country, reaching California by 2003. Since then, outbreaks occur sporadically, with the Texas experience of 2012 standing out as one of the worst. How well do health officials and the scientific community really understand this unpredictable and sometimes devastating disease? And are there other serious yet obscure insect-borne diseases that should worry Texans? The answers are not obvious. But events like the unprecedented West Nile outbreak of 2012 have spurred public health officials, doctors, and scientists to begin looking for answers with a greater sense of urgency. Research is yielding results that may solve pieces of the environmental puzzle. Warmer winters and precipitation patterns are factors that experts are beginning to understand have a bearing on how and when West Nile spikes. And they are learning how better surveillance can help head off future outbreaks. But success will depend on local government’s dedication of the resources to make that happen. Meanwhile, the medical community has made little progress in managing the disease – for which there is no human vaccine or cure – or in helping patients deal with its effects. Just as worrisome perhaps, West Nile virus is one of many insect-borne diseases that could – under the right conditions – create a public health crisis in the state. Dengue fever, entrenched in Mexico and present in some parts of Texas already, could be next. “We have everything in place to be a great epicenter for dengue virus,” Dr. Kristy Murray, associate professor of pediatrics with the Baylor College of Medicine said, speaking of the Houston area. As the experience with West Nile suggests, knowing the scope of such a problem in real time is one of the biggest challenges state and local governments face. Widespread failure to report “exotic” diseases and patchy surveillance due to budget constraints are mostly to blame. But knowledge gaps in the medical community as well as in the public mind contribute, too. So, at least for now, many Texans remain exposed to the risk of getting insect-borne diseases that could change their lives in the blinking of an eye. Read any description of West Nile virus online or listen to a news report about it and several things will almost always be said. Mosquitoes spread the virus. It can cause short-lived flu-like symptoms or no symptoms at all for most people who are infected. Rarely, the virus enters the nervous system or brain. There it can cause meningitis (swelling of nervous tissues that protect the brain and spinal cord), encephalitis (swelling of the brain), paralysis and death. Only certain types of mosquitoes can transmit West Nile. Culex quinquefasciatus, also called the “southern house mosquito” is the oft-cited culprit in Texas. But such facts give a fraction of the information that is needed to understand the disease. People who have contracted West Nile report a wide variety of experiences, even those with milder cases. For Chris Taylor, 33, of Plano, Texas, it took multiple trips to the emergency room and weeks of pain and worry before doctors connected his array of symptoms to West Nile. These included bouts of numbness, tingling and skin crawling sensations, rashes, diarrhea, feeling very cold, and feeling dehydrated, along with fatigue, headaches and intense back pain. “I had so many weird symptoms going on that I did not know what was wrong,” Taylor said. “The doctors I had been to kept telling me there was nothing wrong with me,” he added. Taylor began seeking medical attention in early June of 2012. But his diagnosis lagged, even though his job entailed being out in the woods, with frequent exposure to mosquitoes. By the time he was finally diagnosed with West Nile in mid-August, the field biologist had also contracted and been treated for Rocky Mountain spotted fever, an illness spread by ticks. Even today, Taylor does not know which disease he got first. The time that elapsed before Taylor knew what was wrong was more than just inconvenient, however. A self-described “big, strong guy” standing 6 feet 4 inches tall, Taylor eventually became too weak to bend over or pick up his young daughter, he said. He described the anxiety he went through as doctors suggested he might have multiple sclerosis, lupus, Crohn’s disease, or cancer, and he worried that he could be dying. Worst of all, he began to suspect that some medical professionals did not even believe he was sick. “To be weakened that much and have people tell you or imply that you are lying to them, when all you want to do is get healthy” was a real low point, he said. While Taylor’s story is likely unique in some ways, the resistance among doctors to test for West Nile and the belief that a definitive diagnosis won’t do any good is the prevailing wisdom. “It doesn’t really make a difference for that patient if you know what to call it or not because as long as it’s only fever and a headache, you’re going to get over it,” Haley said. There are cases of a kind of prolonged chronic fatigue syndrome, as well as lingering depression, but these are thought to be fairly uncommon, he added. At the same time, Haley is careful to make the distinction between symptoms of West Nile fever and those of possible West Nile neuroinvasive disease, which include fever combined with “neurological signs.” These he defined as “any kind of objective neurological change that doctors should be able to detect in a routine neurological exam.” “Failure to work that up is malpractice,” he added. Newly updated West Nile guidelines, published by the CDC, cite a stiff neck, altered mental status, seizures, and limb weakness, usually accompanied with a fever, as the most common signs of neuroinvasive disease. While prompt diagnosis of the West Nile virus may be important to individuals, it is also important from a public health perspective. For one thing, positive tests for the virus tell local officials that West Nile is present in their area. And that is especially critical for local health departments that don’t do other types of surveillance like testing of mosquitoes. Yet state statistics indicate that only a very small percentage of Texas West Nile fever cases have historically been diagnosed and reported. The state has required reporting of both fever and neuroinvasive disease since 2005. Experts insist that of all those who are infected by the virus, 80 percent will have no symptoms, 20 percent will have West Nile fever only and less than one percent will develop neuroinvasive disease. Yet, in 2011, the year before Texas experienced its unprecedented outbreak, 74 percent of reported cases – or 20 out of 27 – were classified as neuroinvasive disease. In 2012, when numbers were much larger, neuroinvasive disease still represented a very high proportion of reported cases, at 45 percent. To date in 2013, about 60 percent of the 169 cases reported by the state are neuroinvasive. None of these figures tell the whole story according to Dr. Tom Sidwa, manager of the Zoonosis Control Branch at the Texas Department of State Health Services. He pointed out that the percentages commonly cited on the frequency of West Nile neuroinvasive disease compared to fever are based on a few studies and are only estimated. And he agreed that the states’ yearly statistics and other available research suggest that the majority of fever cases, and some neuroinvasive disease cases, are simply not reported. Though we are probably hearing about most neuroinvasive cases, they are “by no means universally, accurately diagnosed and reported,” he said. But recent research suggests that a diagnosis of West Nile neuroinvasive disease could be routinely overlooked as well. A study of patients admitted to eight Houston hospitals with meningitis found that nearly three quarters were discharged without a diagnosis. The study, which spanned a five-year period, appeared in the Mayo Clinic Proceedings in 2012. Dr. Rodrigo Hasbun, a professor of infectious diseases at the University of Texas Medical School in Houston, is one of the authors of the study. Doctors tend to order tests that will rule out bacterial infections, which are treatable, rather than seeking to diagnose viral infections like West Nile, Hasbun said. Going forward, things may improve, at least in terms of reporting West Nile fever. Sidwa noted that some West Nile cases don’t get reported to the CDC now because they fail to meet certain clinical criteria even though the affected persons still might have the disease. For example, patients without documented fever of 100.4 or higher could not be counted, he said, even if they met other criteria or said they’d taken fever-reducing medicine. Starting next year, that will change, Sidwa said, as the CDC has revised some of its reporting criteria. West Nile virus has been known to occur in Africa, the Middle East and Europe through much of the 20th Century. However, until it came to the US, it was just a febrile illness that occurred in epidemics but without causing neurological damage. The US strain added the severe neurological damage. … Since arriving in the US in its more virulent form, at least two more major mutant strains have begun circulating around the country. Baylor’s Murray is one researcher who is trying to understand the health implications of the disease over time. Formerly with the CDC, Murray helped investigate the first outbreak of West Nile in New York in 1999. Since 2002, she has worked with other researchers at Baylor to further understand the disease in general, and its impact in Texas. Murray and colleagues estimated that more than half a million people had been infected with West Nile in Texas between 2002 and 2011. During that period, fewer than 2,300 cases were officially reported. Since the study period preceded the 2012 outbreak in the state, the numbers are likely far higher today. Murray also helps conduct an ongoing study, begun in 2002, which is the largest to follow a group of West Nile survivors in the country, she said. Two hundred and forty-seven people are enrolled from Texas and elsewhere. The study is collecting data that is important for researchers, Murray said. But it’s also important for the patients, many of whom have reported long-term depression after infection with the virus. “Most of them don’t return to baseline. People who got encephalitis, 75 percent of them will never be back at their normal status again, at their normal functioning,” she said. “So it’s important to document that.” The study has found evidence of lasting depression and chronic kidney disease in some survivors that may be linked to the virus. Eva Whitmer, 37, is a Kansas housewife and mother of four who participates in the study. She tested positive for the virus in July 2006, but her diagnosis of West Nile encephalitis did not come easily. Sick for several weeks before being diagnosed, Whitmer consulted several doctors, including an eye doctor, and was put on antibiotics for strep throat and then a sinus infection. She had neither. Finding long-term relief proved even more elusive. About six months after getting West Nile, Whitmer was still suffering from insomnia, nausea and diarrhea, she said. A new doctor suggested an anti-depressant, which helped but caused her other problems. Whitmer is now on her fourth prescription anti-depressant, but has resigned herself to dealing with the unpleasant side effects. She has learned that they keep her from re-living symptoms she suffered when she first became ill. “If I go off of it, I started getting the diarrhea again. I can’t eat. I can’t sleep. I get severely dehydrated. It’s like my body temperature won’t regulate. It’s just a bunch of weird symptoms,” she said. Debra Koym, 50, of Katy, Texas, got sick back in 2002, and was among the first people to contract West Nile in the state. She is also enrolled in the study. Koym has suffered from severe back pain and headaches as well as bouts of fatigue since then. She’s also had several neck surgeries. But her doctors don’t agree on whether they think her problems are related to West Nile. “Some of them do, some them don’t. You know, it’s whoever you talk to because nobody really knows what does what,” she said. With no available human vaccine for West Nile and no approved treatment to reverse its effects, the medical community today has little to offer those individuals unfortunate enough to contract it – regardless of how it affects them. “Whatever symptoms you’re going to get, you’re going to get. Whatever disabilities you are going to get, you’re going to get,” said Haley of West Nile. “Doctors can’t influence that, but they can prevent you from dying long enough for you to get over it and have a chance to live a longer life,” he added. For instance, breathing machines can help patients survive the acute phase of severe neuroinvasive disease. Walt Mizell is an Austinite in his early 70s who got sick with West Nile in 2012. The former attorney can’t be sure if he got the disease while golfing nearby or in his own backyard. While on vacation, he was struck with a fever and, later, paralysis and intense pain in one leg. Returning early to Austin, Mizell was hospitalized. He was about to receive treatment for another neurologic illness, Guillain-Barre syndrome, when his lab results came in positive for West Nile. Once his diagnosis was clear, doctors sent him home and told him there was nothing they could do. For several months, Mizell said, he was constantly in pain. “I could almost feel the battle with the virus going on everywhere from my hip through the knee down to the tips of my toes. Not all five, just the first two,” he said. Mizell had routinely run four miles a day and had biked through parts of Europe with his wife shortly before his illness. Now, more than a year later, he can walk a mile unassisted, he said. And he is no longer in pain. But he is far from regaining the lifestyle he once had. “Things I used to be able to do and not even break a sweat are just almost beyond my capability now,” he said. Mizell closed his law practice in October 2012, a few weeks after becoming ill. He continues to work towards recovery, despite receiving little information from doctors and therapists about how much or how quickly he can expect to improve. Some answers might be available elsewhere, but survivors may have to travel to find them. Dr. Don Read, a Dallas proctologist who contracted a severe case of the neuroinvasive disease in 2005, created the Dallas-based West Nile virus support group in 2006 to give survivors and their family members a place to turn. He runs the group with the help of his wife, Roberta, who is a nurse. Though he was able to go back to practicing medicine eventually, he nearly died in the hospital, and still wears braces on both legs. Read does not fault doctors for failing to diagnose the disease because it’s relatively new in the United States, relatively rare, and has a tremendous variety of symptoms. “You can’t know everything about everything all the time,” he said. Yet where the medical community has failed to provide information, guidance, and support, the Dallas group has tried to fill a void. Read joked that he keeps thinking the need for the group will go away, but it continues to get new members. “At our last support group meeting, there were three to four people out of 20, that said … either from an email with me or coming to the group was the first time they really understood anything about West Nile virus,” he said. The group has members from out of state and other Texas cities like Austin. For Mizell, a support group member since early 2013, the benefits are well worth the drive to Dallas. The group has helped him tremendously, he said, because he can talk to others who have the disease and learn from their experiences. “The West Nile virus support group in Dallas has made a huge impact on my recovery process and my mental process going through recovery,” Mizell said. “It’s a huge lift to talk to someone who has gone through the same thing,” he added. The CDC issued West Nile guidelines in June 2013 updated from 2003. While the 69-page document contains a wealth of information about surveillance and other public health topics related to West Nile, its treatment of the human experience of the disease is scant. But the 2012 outbreak has spurred some renewed interest in understanding the disease, which is beginning to bear fruit. For instance, Yale School of Medicine researchers recently published findings that could shed light on why the West Nile virus severely affects some people but not others. The article appears in the December 2013 issue of Nature Immunology. Until more is known about the disease and how to cure it, however, surveillance and vector management remain keys to avoiding disease. West Nile outbreaks are hard to predict from one year to the next, and there is a lag between the time that mosquitoes infect people, and the time illnesses are reported. That’s because the virus can incubate inside an infected person for as much as two weeks, and because diagnosis and reporting is often delayed. So an early warning system that tests mosquitoes is the best way currently available to head off large-scale infection in people. In 2013, Dallas County’s chief epidemiologist, Dr. Wendy Chung, and a team of experts completed a study that helped the Dallas area create just such a system. Haley was also part of the effort. “I have been doing research for 40 years on things like this, and rarely do things turn out this well and this interesting,” Haley said. The study was published in The Journal of the American Medical Association. Dallas County has a history of West Nile outbreaks, and has been collecting and testing mosquitoes for the virus for years. Typically, only those species that carry West Nile are tested. The team was able to crunch data from prior years and determine the abundance and infection level, or “vector index,” of the relevant mosquitoes that preceded serious outbreaks in the past. Using this information, they concluded that a vector index of 0.5 or higher in June or July signals an imminent outbreak, which can then serve as an early warning to the public and the healthcare community. Mosquito season in Texas runs at least from May through October and can last all year long in the warmer parts of the state. Such a system can be used to let residents know when taking personal measures, like using repellent, are especially important. And it will alert local officials who can order aerial spraying to kill mosquitos carrying the disease. But obtaining the data to make the process work depends on local entities’ abilities to sample and test mosquitoes. And even with the data in hand, using it to blunt a serious outbreak depends on the political will of local officials to react appropriately to the results. It may be hard for local officials to order unpopular measures like aerial spraying, Haley said, but taking preventive action early is key to halting an epidemic. “What our paper showed is, if they wait until the epidemic has crested, well, it’s too late to prevent most of the cases,” he said. “It takes 3-4 weeks from the time you are bit and get ill to when the case is reported,” he added. Haley was also careful to point out that the “magic number” for the Dallas area which signals an imminent outbreak may not work for other areas. “Whether 0.5 will be the same in Florida, and California, and Michigan, Canada, you know, Mexico – nobody knows. So every region needs to do this same study,” he said. But such procedures will only help if there are resources and expertise available to do the mosquito surveillance and testing. Not all local health departments in Texas have surveillance programs and many areas do not have health departments of their own. According to the Texas Department of State Health Services’ Sidwa, it’s impossible to say exactly how many local jurisdictions are conducting surveillance. That’s because reporting surveillance results is voluntary, he said, so some localities could be testing and not reporting. Based on the information the state is able to collect, surveillance appears spotty. Maps compiled by the department show that mosquitoes positive for West Nile have been detected consistently over time in places like Dallas County, Harris County and Lubbock County, where surveillance systems are well-established, but not necessarily in neighboring counties. And West Nile infections are often reported in a greater number of counties each year than the number that report positive mosquitoes. For instance, in 2012 when the state experienced its worst outbreak, just 21 counties reported positive mosquitoes to the state. Meanwhile, 147 counties reported having a West Nile presence of some type, which could have included human, bird or horse infections as well as positive mosquitoes. The variation is partly a budget issues. Local health departments may not have the budget for such activities, or may have other priorities, said Grace Kubin, director of laboratory services for the Texas Department of State Health Services. Her lab tests mosquitoes for the local entities that submit them. And surveillance is not cheap. Austin Travis County devotes about half its vector control resources to mosquito trapping and surveillance activities each year, according to senior sanitarian Eda Gowdy. Based on budget data, that puts the cost at over $200,000 per year. Nearby San Antonio has never tested for mosquitoes, according to Carol Schliesinger, public relations manager for the city’s metropolitan health district. The city recently cut vector control positions from its budget and relies on area military facilities to test for mosquitos, she said. But whether localities perform such public health functions can have serious implications for those living there, Haley warns. “Public health is a political football. And the two parties kick that ball around,” Haley said, which may result in their resources being cut. “If that happens, the unfortunate citizens who get West Nile are just out of luck because the docs in the community won’t know there’s an epidemic. They won’t know to look for it and they won’t diagnose it,” he said. Part of the reason each region needs to do its own study is that weather patterns, plant and animal habitats, and human impact on the environment differ widely from place to place. The Dallas research team looked at weather and housing patterns to find clues about what might be driving large outbreaks. They found that the unusually warm winter preceding the 2012 outbreak in the Dallas area was a significant factor in producing it. In fact, they concluded that the winter preceding the epidemic was the mildest in a decade, based on the absence of hard winter freezes, warmer than normal temperatures and more rain. The team also found that cases clustered in a “hot spot” that differed from other parts of the county in at least three ways. It had relatively high property values, high housing density and a high percentage of unoccupied homes. It has been said that all politics is local. To some extent, so is climate change. At least that’s one of the implications of a study, published in 2013, which looked at the likely long-term effects of climate change on West Nile transmission in the United States. The results appeared in the Proceedings of the National Academy of Sciences. The study found that projected temperatures and precipitation patterns in the next several decades could actually decrease mosquito populations during the summer across the southern states, including Texas. But that is just one piece of the puzzle. “We really can’t say definitively what the actual effects on West Nile virus transmission to humans would be,” said Cory Morin, a researcher at the University of Arizona in Tucson who co-led the study. When it comes to West Nile, understanding the small areas or “micro-climates” in which mosquitoes live and breed may be just as important as predicting the broad effects of climate change. Even when overall conditions are hotter and drier than before, shaded places or places near water sources – whether natural or man-made – can still provide viable locations for mosquitoes to prosper. And these areas can be very small, measured in feet or perhaps yards, Morin said. “It doesn’t take a lot of area for a mosquito to live. It can stay in that area, breed in that area, find hosts nearby,” Morin said. Durland Fish, a professor of epidemiology, forestry, and environmental studies at Yale University’s school of public health has no doubt that climate change is affecting vectors of disease. He’s been studying diseases carried by insects and ticks, called arboviruses, since 1970 and recently helped launch a study of mosquitoes in the Florida Everglades. “Changes in climate will affect – without a doubt – will affect vector populations,” he said. “Now, which populations, which species, and whether the effect is going to be positive or negative in terms of the population size or distribution – that is hard to predict.” Meanwhile, Fish said, there is not enough research underway to help us understand and prepare for these changes. Steve Presley, a researcher at Texas Tech University in Lubbock and an associate professor at the Institute of Environmental and Human Health, agrees that predictions are hard to make, especially when change can come from many directions. Lubbock, Texas, is a good example. The area has no native trees, Presley said, yet the city is now covered with them. They provide a new habitat for animals and insects. “We’ve created these artificial islands where wildlife, and arthropods – insects – can survive and get a foothold because it’s an artificial oasis. And that increases the potential for human interaction with those diseases and exposure to those diseases,” he said. Complicating things further is the fact that viruses themselves are dynamic. “The viruses are constantly changing and adapting [to] the new host, new environmental conditions, and, you know, new drugs, even,” he said. Curiosity might have killed the cat, but in the field of science, it more often leads to better outcomes. Baylor’s Kristy Murray is a case in point. A leading expert on West Nile and it’s long-term effects on humans, she wondered about a set of Houston area patients who had symptoms that suggested West Nile, but tested negative for the disease. Retesting the original blood samples, she found dozens that tested positive for dengue fever, another virus carried by mosquitoes. Even more surprising to some, Murray found evidence that at least some of those cases were locally transmitted because victims had not traveled recently. Her results were published in 2013 in the journal Vector-Borne and Zoonotic Diseases. Though the research was conducted between 2003 and 2005, Murray doesn’t think the instances she found are unique or that the risks of a bigger outbreak have gone away. “I think we’re certainly set up perfectly to have an outbreak of dengue here,” she said. Funding ended, and other things changed after that study, “so we don’t know if transmission continued or not,” Murray wrote in an email. Dengue, like West Nile, can produce high fevers, bad headaches, and eye pain. It can be fatal. Like West Nile virus, there is no specific treatment or vaccine for the disease. And while the diseases share a vector in the mosquito, there are differences. West Nile virus passes back and forth between mosquitoes and “reservoir hosts,” which are usually birds. But infected humans do not infect mosquitoes. Dengue, on the other hand, has no other hosts. The virus spreads back and forth between humans and mosquitoes, making population density a key factor in whether or not dengue becomes established in a particular region. That’s part of the reason Murray worries about dengue getting a foothold in urban areas like Houston. “All it takes is one person coming from Mexico who’s infected with dengue,” Murray said. If mosquitoes feed on that person while they still have the virus in their blood, Murray explained, it will spread. “That’s all you need,” she said. Dengue fever was once common in the southern United States. A post-World War II eradication campaign throughout the Americas all but eliminated the mosquito that carried it, and with it the disease. “In 1923 there were 40,000 cases of dengue fever in Texas,” said Presley. “We got rid of it but now it’s starting to come back,” he said, citing climate change and the use of less effective chemicals to control the mosquitoes as reasons for the re-emergence of the disease. Dengue, which has been resurging throughout South and Central America since 1980, recently became re-established in Florida. As of late November 2013, the Florida Department of Health reported 23 confirmed cases of locally acquired dengue for the year. Florida first identified such cases in 2009. Before that, dengue did not occur locally in the United States except in Puerto Rico, the U.S. Virgin Islands, and American Samoa. Dengue, also known as “breakbone fever,” differs from West Nile in other ways. As the nickname implies, it can also cause intense joint, bone or muscle pain. But more worrisome for epidemiologists and others who study the disease, there are currently four known strains or serotypes of the virus, which means re-infection can occur up to four times. This fact has made developing a vaccine difficult. And a deadlier form of the disease, called dengue hemorrhagic fever, more often occurs in those who are re-infected with the virus. Dengue is present in Texas, but is seen as a limited problem that occurs mainly among travelers or along the Texas-Mexico border. “We have dengue outbreaks every 4 or 5 years. It’s anticipated that dengue will become endemic in south Texas with the associated outbreaks continuing to occur every few years,” wrote Christine Mann, a press officer with the Texas Department of State Health Services, in an email. This could be one of those years. As of early December 2013, 52 cases of dengue had been identified in the state, according to Chris Van Deusen, another press officer with State Health Services. Twenty of those have occurred in South Texas. “This is certainly more dengue cases than we would expect to see in a given place and time, the definition of an outbreak,” he wrote in an email. And at least seven of the individuals reported no travel history, according to Van Deusen, which means they likely acquired the disease locally. By contrast, the department’s website reports there were 154 cases of dengue from 2003 through 2012 in the state. All but five of those were considered imported, according to Mann. However likely, if dengue does come back in greater numbers, we might not know it. The amount of dengue worldwide has been significantly underestimated for decades. A recent study upped current estimates from roughly 100 to 400 million people per year who acquire the disease. And researchers who studied dengue’s prevalence along the Texas-Mexico border in 2004 concluded that the amount of disease was significantly underreported on both sides. Ironically, Rodriguez said, many residents go across the border for diagnosis and treatment where costs are lower and doctors are better at screening for these diseases. And patients seen in Mexico will be counted as Mexican cases not American, regardless of where they live, according to Rodriguez. On the American side, laboratory tests are generally used to diagnose dengue. But the process can be complicated and multiple tests are sometimes needed to confirm the diagnosis. Meanwhile, the state lab does not test mosquitoes for dengue as it does for West Nile so reports of human illness are the only form of surveillance. And aerial spraying, which knocks down West Nile carriers active at dusk and dawn, won’t affect the species of mosquitoes that carry dengue, which are active during the day, Murray said. But the news for Texans is not all bad. A 2003 study of the city of Laredo and its Mexican counterpart, Nuevo Laredo, found that sealed windows and air-conditioning in Texan homes, as well as the tendency for people to avoid the outdoors in hot months, could help keep dengue from spreading here. In the realm of exotic and elusive diseases like West Nile or dengue, most public health and healthcare professionals seem focused on honing their ability to respond – if and when the next crisis arises. That’s if they are thinking about such diseases at all. But experts, like Yale’s Durland Fish, see a bigger picture. From his vantage point, he seems to sound a warning bell, urging us to be more proactive. He thinks people who don’t see the need for additional research on these vector-borne diseases, or who point to relatively low levels of illness relative to infection rates for diseases like West Nile, are missing the point. “This virus invaded North America … and it just tore through the United States infecting millions of people in a short period of time,” Fish said, referring to West Nile. “What if it had the same fatality rate as yellow fever, which is a closely related virus, which has about 30 percent fatality rate?” he asked. “I mean, there’d be a lot of dead people around. And what would we do about it? We have a vaccine for yellow fever. But we don’t have a vaccine for West Nile. And there’s 300 other arboviruses out there,” he said. For those affected, there is nothing theoretical about the devastating effects of such viruses, fatal or not, spread by tiny creatures you can barely see. Hal Dalton, an Oklahoma man who contracted West Nile in 2012, is still incredulous. “I cannot believe that a mosquito, no bigger than a thread, can be that potent,” he said. One summer evening, he was unable to get out of his chair. A few hours later, the then 78-year-old Dalton was blind. He eventually recovered his sight. But more than a year later, the former gym enthusiast and weightlifter battles weakness and paralysis throughout his body. Like other survivors, Dalton works hard for small gains and has found help and encouragement in Read’s Dallas area support group he could not find elsewhere. Going forward, there is plenty that can be done to lesson the risk that more people will suffer such life-altering hardship. Individuals can take steps to protect themselves, like using insect repellent and dumping standing water around their homes. Doctors can ramp up testing for viral diseases, like West Nile or dengue, and educate themselves about unfamiliar diseases that have potential to become entrenched in Texas. Better recognition of diseases we know are here could illuminate the real scope of the problem and spur greater efforts to develop treatments and vaccines. Meanwhile, local governments can take steps to monitor risks and react swiftly, even as scientific communities continue to study environmental factors that affect how and when these diseases spread. But whether any of this will happen is an open question, especially for diseases that currently fly under the radar, or only seem to show up periodically, like West Nile. When it comes to West Nile, Haley said, a big epidemic will probably only happen every three to six years. “In between years, people wonder why we’re spending all this money doing all this mosquito stuff. And they might just cut it out … the year before the big epidemic hits. And then we won’t be ready again,” he said. Let’s hope we can do better than that.